Join the discussion on our forums! 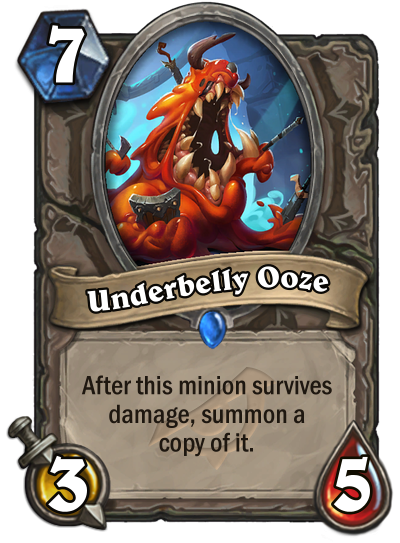 Come discuss Underbelly Ooze over in our dedicated Underbelly Ooze discussion topic. I don't understand why so many people think this as a new Grim Patron. Doesn't it summon a damaged copy? Yes, and that's its weakness, buuuut give it Rocket Boots and you have a pre-nerf-Warsong Commander-type deal. With Bouncing Blade (in wild) it will summon lots of damaged Underbellies. It's what they call the sewers of Dalaran, a place for PvP in the city in WoW terms. probably never gonna see play 7 mana is a lot for "do nothing"
Might have potential with Serrated Tooth. I think you just play Batterhead at this point but I doubt any of them make it to Rogue decks. Does it summons a damaged copy so? Yes it does, it says "After"